MAP: 13 High-Rises Will Add 895 Market Rate Apartments to Fourth Ave.
Left to right: 225-227 Fourth Ave., 581 Fourth Ave., 275 Fourth Ave., 470 Fourth Ave.
PARK SLOPE — A baker's dozen of development is headed to Fourth Avenue. 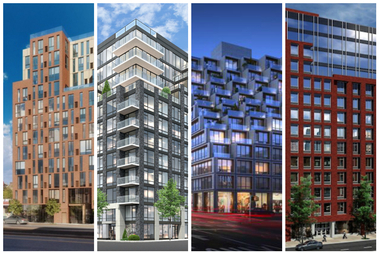 With two more high-rises recently announced, there are now plans for 13 tall buildings on the stretch of the avenue that divides Park Slope from Gowanus. If all of the buildings are completed as planned, they'll bring a total of 895 units of housing to the area, none of which will be below market rate. Developers recently filed plans for a 12-story, 125-unit building at 541 Fourth Ave., near 15th Street. Down the street at 243 Fourth Ave., developer Haysha Deitsch has plans for an 11-story, 16-unit building at President Street. With a seemingly unending stream of new luxury rentals and condos, some analysts say Brooklyn's real estate market could be "softening," according to the Wall Street Journal. The project coming to 541 Fourth Ave. means all four corners of 15th Street and Fourth Avenue will be occupied by new developments, the blog One More Folded Sunset noticed. On the northwest corner, the nine-story 548 Fourth Ave. was completed in 2013. There’s currently a two-bedroom apartment for rent there for $4,130, according to StreetEasy. Across the street, Brookland Capital plans 550 Fourth Ave., an 11-story, 38-unit building. On the northeast corner, there are plans for a 141-unit rental building with retail at 535 Fourth Ave. The map below shows sites where high-rises are planned along Fourth Avenue between Baltic Street and 22nd Street. Some haven't broken ground yet, some are under construction.